ASIA AND ITS ISLANDS ACCORDING TO D'ANVILLE; DIVIDED INTO EMPIRES, KINGDOMS, STATES, REGIONS, &CA. 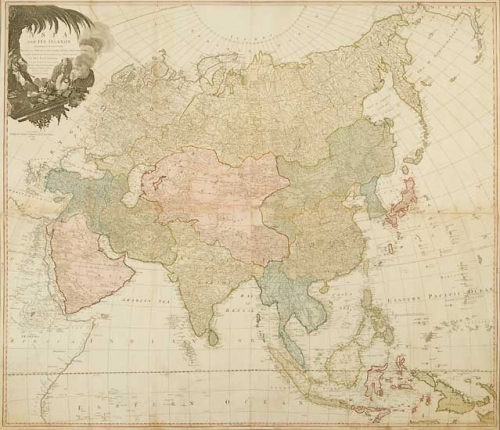 WITH THE EUROPEAN POSSESSIONS AND SETTLEMENTS IN THE EAST INDIES AND... ALL THE DISCOVERIES MADE IN THE EASTERN PARTS BY THE ENGLISH UNDER CAPTN. COOK. Joined four sheet map. 40 1/2 x 47" (103 x 119.5 cm) plus narrow margins.